Sky Blue FC: Sheridan; Freeman, Stott, Skroski, Gibbons (Hoy, min. 85), Killion, Rodriguez (Groom, min. 46), Lloyd, Beckie, McCaskill, Johnson (Tiernan, min. 85). Houston Dash: Campbell; Keever, van Wyk, Brooks, Agnew (Latsko, min. 71), Mewis, Hanson, Simon, Ohai (Kgatlana, min. 76), Daly, Prince (Jordan, min. 90). SCORE: 0-1, min. 24, Prince. 1-1, min. 57, Johnson. 1-2, min. 59, Daly. 2-2, min. 73, Johnson. 2-3, min. 79, Latsko. INCIDENTS: 2018 NWSL regular season match. Match played at Yurcak Field in New Jersey. FT: Wow, that was fun! Thank you for follow along. This is Felix Hernandez for VAVEL USA, hoping you enjoyed the match as much as I did. Sky Blue FC 2 Dash 3. So long everybody! Fulltime: Houston Head Coach Vera Pauw earns her first win in the NWSL and first of the 2018 season. 90+4': Referee blows the final whistle and it is over! Sky Blue FC 2 Houston Dash 3. 90': 3 minutes of stoppage time! Teams are not only trading goals but trading chances. Match opening up as Sky Blue FC try for an equalizer. 83': Johnston nearly scores the hat trick and equalizer. Her shot from inside the box just missed the left post. Goal kick Houston. 82': Simon tries a long range shot from outside the box, goes over the bar. 79': GOOOOOOOAALLLLL! Houston Dash! Dash substitutes make this one happen. Kgatlana right side cross finds Latsko left foot past Sheridan! 76': Houston Dash Substitution - Kgatlana IN Ohai OUT. 75': Sheridan makes a save off a weak Prince shot from outside the box. 73': GOOOOOOOOAALLLLL! Sky Blue FC! Katie Johnson has another! Sarah Killion's corner finds Johnson head and in! 66': Big save by Sheridan! Daly got the ball away from two defenders in the box but Sheridan stops her point-black shot. As of now Dash second goal is credited to Daly and assisted by Ohai! 64': Yellow Card. McCaskill is shown a yellow card on a bad foul on Simon. 59': GOOOOOOOOOAAALLL! Houston Dash! Houston Dash get the goal back. Rachel Daly crosses a ball from the right side near the corner spot. Sheridan miss plays the cross and ball finds the back of the net. 57': GOOOOOOOOAAAALL! Sky Blue FC! Katie Johnson slots home in front of Campbell off a Shea Groom cross! 55': Sky Blue's Johnson comes down the right flank. Campbell comes out and misses the challenge. Johnson shot is blocked by Brooks. 53': Dash wanted a Sky Blue FC hand ball in the box off a Simon shot but the referee is having none of it. 50': Agnew fouls McCaskill in Sky Blue FC offensive half. 48': McCaskill is called for offside. 45': Kickoff! We are underway in the 2nd half! HT: Give an assist to Lindsey Agnew on the Prince goal. Referee blows the Halftime whistle! 44': Sky Blue FC unable to get anything going offensively. 41': Gibbons is fouled hard by Keever. Gibbons is shaken up a bit but gets up on her own. 40': Another corner kick for the Dash. Ball cleared. 38': Mewis not giving up, giving Sky Blue midfielders and defenders a headache. Almost shot on goal but blocked by a Sky Blue defender conceding another corner. Daly has been a force tonight! 30': Daly tries a shot from outside the box but the shot goes wide right. 27': Ohai whips the ball into the box that finds Daly's head but goes over the bar. 24': GOOOOOOOAAAAL Houston Dash! Prince taps the ball in the net off a ball that pin-balled in the six yard box. 21': Ohai and Daly force Sky Blue FC to give-up the matches first corner kick. 18': Hard foul by Johnson on Agnew. Referee give Johnson a talking to. 12': Foul by van Wyk on McCaskill about 30 yards from net. 7': Lloyd with a shot on goal outside the box for Sky Blue first shot on goal of the match. Campbell is equal to the task and makes the save. 6': Daly beats her defender on a long ball but her shot is wide right. 2': Save Sheridan! Ohai gets away from her defender and gets the first shot on goal of the game. 1': Kickoff - We are underway! Getting close to kickoff and the starting lineups are in! Houston Dash are winless in their last 11 matches (8 losses 3 draws). A franchise worst. Injury report for both teams is out ahead of tomorrow's match. Be sure to check back here as new information such as injuries and starting lineups becomes available. Then join me Saturday for live game updates. Dash midfielder Linda Motlhalo was injured in the last match against North Carolina. Her lower leg appeared to be injured in the 76th minute. Rachel Daly carried her teammate off the pitch. No word yet if she will miss any time as the injury report comes out Friday. Carli Lloyd and Janine Beckie will play their first match against the Houston Dash after being traded in the off-season. Lloyd spent three seasons in Houston scoring 11 goals in that time. Beckie spent two seasons in Houston scoring five goals in that time. Sky Blue and Dash were involved in the blockbuster trade that sent Lloyd and Beckie to Sky Blue. Houston Dash acquired Christen Press in the trade but Press has not yet reported to Houston choosing to play in Sweden. Last season Sky Blue FC won both games against Houston. Sky Blue combined for five goals in the two games while Houston only scored two. Sky Blue midfielder Sarah Killion converted on penalty kicks in each match. The Dash were downed by the North Carolina Courage 2-0 in Houston, last week in the NWSL game of the week. Houston had a difficult time containing Crystal Dunn, Jessica McDonald and NWSL Player of the Week McCall Zerboni. The Courage tallied goals from Dunn and midfielder Kristen Hamilton. Forward Kealia Ohai made her return to the Dash starting lineup after recovering from her last season’s ACL injury. Australian international Kyah Simon made her debut for the Dash. Simon has been with the Westfield Matildas during the beginning of the season. Goalkeeper, Jane Campbell was able to make five saves. Defender Janine van Wyk recorded six blocked shots. Nichelle Prince, Amber Brooks and Kristie Mewis had scoring chances but were unable to find the back of North Carolina’s net. Last week Sky Blue did not play. Last weekend was the second bye week for Sky Blue this season. They have the lowest games played in the league and are tied with the Dash with the fewest goals scored with one goal. Rookie Forward Savannah McCaskill scored the only Sky Blue goal of the season in a 1-1 draw against the Chicago Red Stars. McCaskill’s goal was the equalizer and came late in the match giving Sky Blue their first point in the 2018 season. Sky Blue FC (0-2-1) are currently at the bottom of the NWSL standings with one point. While the Dash (0-3-2) are one spot above Sky Blue with two points. Both teams have earned points against the Chicago Red Stars. While Dash’s only other point was a draw against the Utah Royals FC. Both teams will be looking for their first win of the 2018 season. 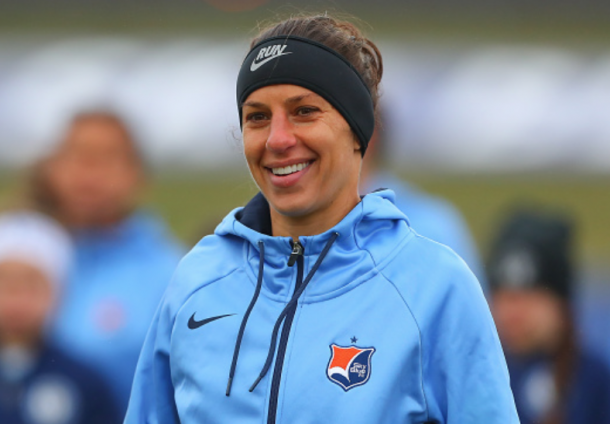 Houston Dash will travel to take on Sky Blue FC at Yurcak Field in Piscataway, New Jersey. 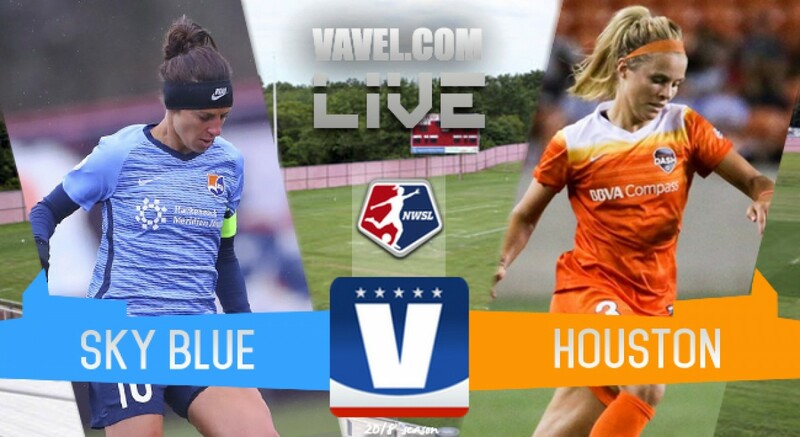 Hello and welcome to VAVEL USA’s Live coverage of the National Women’s Soccer League’s Week 6 matchup between Sky Blue FC and and the Houston Dash. My name is Felix Hernandez and I will be your host. From now until kickoff on Saturday May 5 at 7:00 EST, we will be keeping you updated on news and notes. Be sure to come back at kickoff for LIVE updates.